For the auspicious festival of Rakhsha Bandhan i bring you this lovely recipe sent to me by Harkirat Oberoi. Sorry for the quality of the pic. This is his recipe and i am copying it the way he sent it to me. Saffron (Nitu Didi sent me some) – 1/6 th gram [reserved few strands to garnish and dissolved the rest in warm milk for 20 mts. Almond / Pistacchio slivers to sprinkle on top. Except the garnishing ingredients, blended all the items in a large bowl on a bed of crushed ice. I do this so that the body of the yoghurt remains firm and when we refrigerate, Shrikand does not crystallise, rather remain smooth. Garnish to serve in individual bowls. 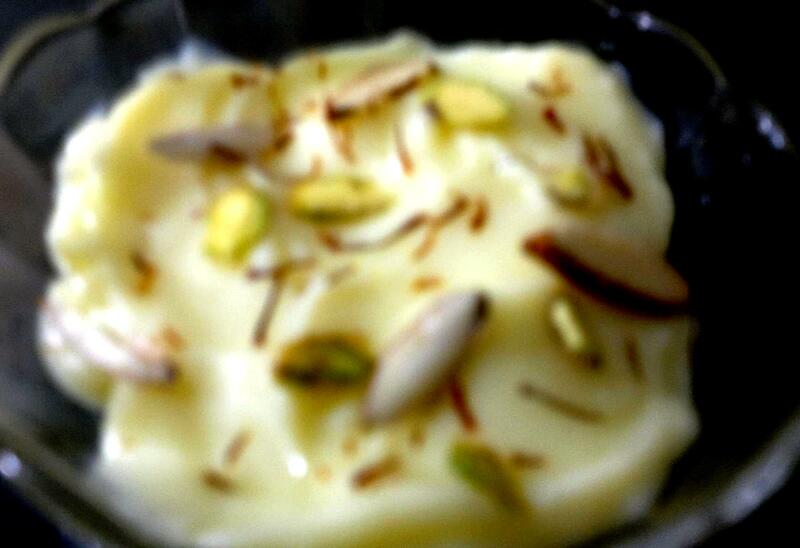 This entry was posted in Eggless Sweet Temptations, Everything Vegetarian, Gluten Free, Indian Restaurant Dishes, Saffron and tagged desi, festive, saffron, srikhand, sweet, yogurt. Bookmark the permalink.